Do you find yourself rehearsing your lines in front of a mirror; or harassing family members to be a part of your video projects? If you answered yes, continue reading because In the Mix Birmingham has the perfect mixer for you. 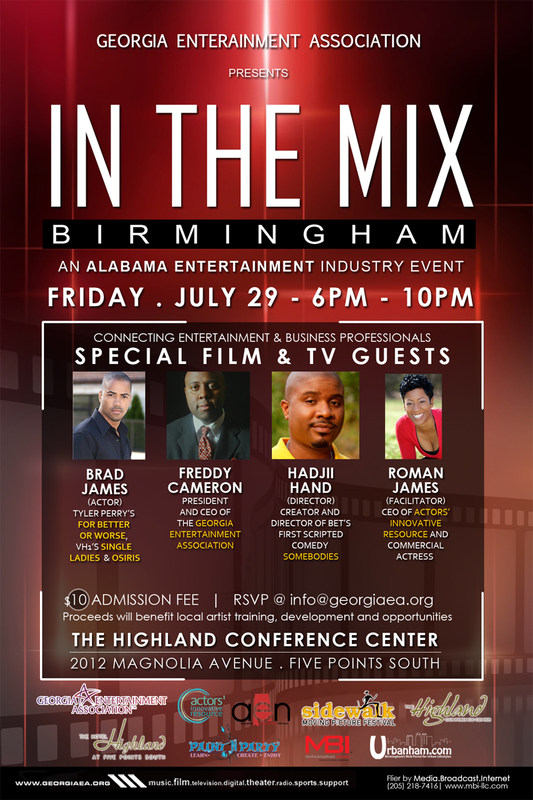 In the Mix, a popular Atlanta Entertainment Industry and Business Mixer, will kick off it’s Birmingham series July 29th at the Highland Conference Center. The first In the Mix event will focus on Film and Television with actor Brad James, who is cast in several episodes on VH1′s Single Ladies and also a regular role in Tyler Perry’s new television show, For Better or Worse. James has also appeared in MTVs Teen Wolf and Tyler Perry’s Meet the Browns. Joining James will be director Hadjii Hand who created and directed BET’s first scripted show Somebodies. The panel will be facilitated by actress and CEO of Actors’ Innovative Resources Roman James. Tonight’s Mixer will be held at the Highland Conference Center from 6pm-10pm, the cost of admission is $10.00. Chloe Collins, Executive Director of the Sidewalk Film Festival will be amongst tonight’s special guest. Entertainment tonight will include live music from 5th Element featuring Albertine and Watts. Come out tonight to Mix and Mingle with film and television professionals. The Highland Conference Center, 2012 Magnolia Avenue in Five Points South – 6pm – 10pm. For more information on In the Mix Birmingham as well as workshops they are providing please check out the links below!